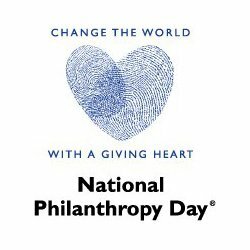 Every year on November 15, National Philanthropy Day gives us a chance to recognize and honor the people who make a difference in our lives, in our communities and in our world. You won't find any cards at Hallmark that celebrate this annual event. Even so, I'd like to suggest that you send a card anyway. In fact, I encourage you to thank at least three different supporters this month. Send a thank you note to a foundation that has funded your work in the past. Sure, you thanked them when they awarded you the grant. No doubt, you'll thank them again when you submit your final report. And, you'll likely thank them again when you seek future funding. The difference is, this time, there's no ask and no expectation. You're simply letting them know how much you appreciate their support - today and every day. Thank a foundation that hasn't given a grant to your organization. This one might seem counterintuitive. Why would you thank someone who hasn't supported your program? That's easy: they haven't supported your program...yet. Take the time to thank a foundation that supports your local nonprofit community. Not only will the foundation appreciate this unexpected gesture, they will remember it. Don't forget to thank donors, volunteers and other key supporters. Foundations aren't the only ones that are helping to move your organization forward. Donors, volunteers and staff all play an important role in your nonprofit's success. A simple, heartfelt "thank you" can really make someone's day...and go a long way. You won't be able to thank everyone, so consider enlisting your board to help. Although many board members are uncomfortable making calls to ask for support, nothing is easier than calling a donor or volunteer just to say "thank you." How many thank you cards will you send this month? How many calls will you make? Send me a message and let me know who you'll be thanking on National Philanthropy Day and why. With year-end fundraising right around the corner, here are three links to interesting blogs and articles that will help you to get it right. Send a message to learn more about grant writing support services.